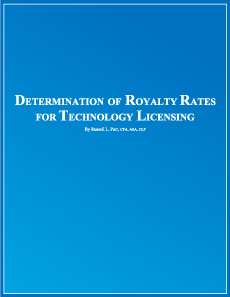 Act now to get this new reference packed with tables and graphics, data analysis, and how-to information on calculating royalty rates for your technology! A comprehensive review of surveys, data analysis, rules of thumb, profit differential methods and discounted cash flow analysis for determining an appropriate royalty rate for technologies. Guidance on the impact on royalty rates associated with exclusivity, minimum royalty payments, upfront license fees, naked patents, and royalty rates for trade secrets. Technology Transfer Tactics is proud to partner with IPRA Inc. in bringing this critical reference to our customers. IPRA is a consulting and publishing organization launched in 1993 and headed by founder Russell L. Parr, CFA, ASA, who has over 30 years of consulting experience involving the valuation and pricing of patents, trademarks, copyrights and other intangible assets.